Honda BigWing, an exclusive one-stop sales and service centre for Honda Big Bikes with models ranging from 250cc and above made its debut at Ee Tiong Motorsports Sdn Bhd. Honda BigWing adopted the most advanced design among Honda global operation, known as “The Destination for Riders”. It consists of a state-of-the-art showroom, service centre, parts and accessories corner and customer lounge. The whole distinctive concept was designed to provide a cool, sophisticated and premium atmosphere, offering a unique customer experience. After Setapak, this year 3 more Honda BigWings is set to open in Penang, Selangor and Johor. The opening also saw the announcement and preview of the much anticipated X-ADV, 2018 Honda CRF1000L Africa Twin and CB1000R, which targeted to be available to Malaysian customer 1st half quarter of the year and another 2 models will be ready in the 2nd half of the year. Ee Tiong Motorsports located in Setapak was chosen as the first Honda BigWing sales and service centre in Malaysia based on its central location, large customer base and also it’s 24 years of experience plays a big role for BSH’s confidence in their ability to exceed the expectations of customers. With its 5,535sqft space Honda BigWing is aimed at providing more space and comfort for customers. 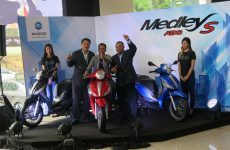 Honda BigWing Setapak will also be holding frequent activities such as International convoy events and bikers gathering. This allows customers the opportunities to experience world-class events and exclusive privileges. Customers will be granted a complimentary Honda BigWing member card with 10% discounts on Honda genuine parts & accessories, special insurance package, technical advice, motorcycle breakdown assistance and many more exclusive invites to Honda’ activities all year round. To find more information you can contact Ee Tiong Motorsports Sdn Bhd at 03-40236192 or visit them at No 384 , 386, 388, 390 Jalan Pahang, Setapak, Kuala Lumpur or log on www.facebook.com/pg/hondabigwingsetapak/. Next PostProgram Sokongan dan Kerjasama Kawasaki – UniMAP.